Policies for sustainability cannot wait until all the facts are known. We must plan and implement radical changes in technology and lifestyle, in spite of irreducible uncertainty, ignorance, and value-conflicts. The commitment of all of civil society is necessary for such changes to be accomplished; thus sustainability is a moral issue. The relevant knowledge base must be robust in relation to the constraints and demands of this new context of use. It must be designed to be fit for its various functions in the discursive, inclusive policy processes on complex issues that are essential for consensus. All stakeholders (including those who produce, use and are affected by policy-relevant knowledge) should be equipped with tools for a critical self-awareness of their engagement with that knowledge. These are now being created by developments based on the insights of NUSAP and Post-Normal Science. In that way we will achieve the robust knowledge that is essential for sustainability. This website is maintained by Jeroen van der Sluijs (editor-in-chief, Copernicus Institute of Sustainable Development, e-mail: j.p.vandersluijs@uu.nl), Silvio Funtowicz, Jerry Ravetz, Serafin Corral Quintana, James Risbey and Ângela Guimaraes Pereira. Science, as it stands today, faces a crisis of public and political trust, combined with an inner erosion of standards of quality and integrity. Scientific findings are increasingly recognised as neither as reliable, nor reproducible, as they used to be portrayed. Beliefs in, and self-declarations of, the disinterestedness of scientific endeavours, separated from vested interest, political agenda or social and cultural context are recognised as empirically and philosophically problematic. Scientific elites are, for better or for worse, challenged by an erosion of trust on a par with that experienced by political elites in modern societies. Scientific institutions charged with higher education face demands of high societal relevance and impact which they do not know how to meet and how to prepare for. This crisis on multiple fronts calls for a fundamental reform. Post-normal science (PNS) offers direction to such a reform, as a critical concept challenging mainstream practices of science, as an inspiration for new styles of research practice, and as an inspiration and support for new conventions of research quality assurance that better respond to the post-normal conditions of today's societal challenges. This multifaceted nature of PNS is both descriptive and normative. It provides a framework for describing and diagnosing urgent decision problems – post-normal issues – characterized by incomplete, uncertain or contested knowledge and high decision stakes, and critical reflection on how these characteristics change the relationship between science and governance. At the same time, PNS inspires a movement of critical resistance and reform towards a new style of scientific inquiry and practice that is reflexive, inclusive (in the sense that it seeks upstream engagement of extended peer communities) and transparent in regards to scientific uncertainty, ignorance, values and framings, and moving into a direction of democratisation of expertise. This fourth PNS symposium [PNS1 in Bergen, NO, PNS2 in Ispra, IT (summarized in a recent special issue of Futures) and PNS3 in Tübingen, DE] provides a platform to discuss and explore the guidance that post-normal science can offer in finding a way out of the present crisis in and around science. Dankel, D.J., Vaage, N.S., Van der Sluijs, J.P. (2017) Editorial: Post-Normal Science in Practice. Futures. Saltelli, A., & Funtowicz, S.O. (2017). What is science’s crisis really about? Futures. Kønig, N., Børsen, T. and Emmeche, C. (2017). The ethos of Post-normal science. Futures. Hiis Hauge, K. and Barwell, R. (2017). Post-normal science and mathematics education: educating future citizens for extended peer communities. Futures. Benessia, A., & De Marchi, B. (2017). When the earth shakes ... and science with it. The management and communication of uncertainty in the L’Aquila earthquake. Futures. Wildschut, D. (2017). The need for citizen science in the transition to a sustainable peer-to-peer-society. Futures. Guimaraes Pereira, Â, and Saltelli, A. (2017). Post-normal Institutional Identities: Re-inventing Advice to Policy. Futures. Saltelli, A., & Giampietro, M. (2017). What is wrong with evidence based policy? Futures. Bremer, S. (2017). Have we given up too much? On yielding climate representation to experts. Futures. Verrax, F. (2017). Engineering ethics and post-normal science: A French perspective. Futures. Kovacic, Z. (2017). Investigating science for governance through the lenses of complexity. Futures. Tsukahara, T. (2017). New Currents in Science: The Challenge of Quality, examining the discrepancies and incongruities between Japanese technoscientific policy and the citizens' science movement in post-3/11 Japan. Futures. Call for contributions Discussions of recent political events – most notably the presidential election in the United States and the referendum in the United Kingdom to (Br)exit the European Union - frequently refer to ideas of ‘post-truth’, ‘post-evidence’ or ‘post-factual’ politics. In its ambiguity, the idea of a ‘post-truth’ age manifests a crisis of trust in both democratic and scientific institutions. At the same time, it implies the untenable assumption that politics and policies were once, and should be again, based on a unique truth provided by science (comprising the whole spectrum of natural and social sciences, and humanities). Turnpenny, J.R. (2012) Lessons from post-normal science for climate science-sceptic debates, Wiley Interdisciplinary Reviews: Climate Change 3 (5) 397-407. Röckmann, C., Ulrich, C., Dreyer, M., Bell, E., Borodzicz, E., Haapasaari, P., Hauge, K.H., (...), Pastoors, M. (2012) The added value of participatory modelling in fisheries management - what has been learnt?, Marine Policy 36 (5) 1072-1085. J. de Boer, J.A. Wardekker, J.P. van der Sluijs (2010), Frame-based guide to situated decision-making on climate change, Global Environmental Change 20 (3) 502-510. A.B. Knol, P. Slottje, J.P. van der Sluijs, E. Lebret (2010), The use of expert elicitation in environmental health impact assessment: a seven step procedure, Environmental Health 9:19. Silke Beck: Between Tribalism and Trust: The IPCC Under the "Public Microscope"
Andrea Saltelli (2011) Sensitivity auditing. Gauging model quality in relation to model use. Andrea Saltelli and Beatrice D’Hombres (2010) Sensitivity analysis didn’t help. A practitioner’s critique of the Stern review. Global Environmental Change 20 (2010) 298–302. Andrea Saltelli and Paola Annoni (2010). How to avoid a perfunctory sensitivity analysis, Environmental Modelling & Software 25, 1508-1517. Andrea Saltelli and Silvio Funtowicz (2004) The Precautionary Principle: implications for risk management strategies International Journal of Occupational Medicine and Environmental Health, 2004; 17(1): 47-58. A selection of papers from the symposium "Post Normal Science – perspectives & prospectives 26-27th June 2009: Oxford On the occasion of the 80th birthday of Jerry Ravetz, has been published in a special issue of Futures. Davies, 2011 Postmodern times: Are we there yet? Expected impacts of climate change are associated with large uncertainties, particularly at the local level. 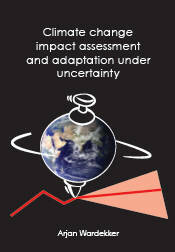 Adaptation scientists, practitioners, and decision-makers will need to find ways to cope with these uncertainties. Several approaches have been suggested as ‘uncertainty-proof’ to some degree, but their suitability depends on the specific situation. For instance, some approaches work well under deep uncertainty, while others perform better under lower levels of uncertainty. This thesis presents several empirical studies on climate change impacts & adaptation under uncertainty in actual adaptation decision-situations. Methods used include expert elicitation, document analysis, empirical workshops, discourse analysis, literature review, and case-study analysis. A new book "Science for Policy" edited by Ângela Guimarães Pereira and Silvio Funtowicz appeared with Oxford University Press (India). On Thursday 5 November the book will be launched at the Université de Versailles St-Quentin-en-Yvelines (Guyancourt site), in the presence of both editors and most of the contributors. This volume discusses the changing role of science in policymaking. Producers and users of science and technology for policy are increasingly aware of the need to change the ways in which knowledge is produced and deployed, especially science‐based knowledge used to foster, support, or legitimize policy decision making. The challenge is to develop new decision‐making styles in order to cope with deep uncertainty, even ignorance, about facts, and in a plurality of value systems. A group of students from Aalborg University applied the NUSAP approach to the risk of methane migration into houses situated on the terminated landfill “Skrænten” in Hjørring, Denmark”. The team consists of Marie Inger Dam, Jon Kjær Jensen, Jóhann Gunnar Jónsson, Mathias Krause Kristensen, Ane Katrine Mortensen, Ole Papsø, Mette Skovmand and Tom Børsen. Their report "Inclusion of Pedigree-analysis (NUSAP) in undergraduate science education: An example" is now available. It may serve as an example and source of inspiration for other students and professors who would like to use NUSAP in BSc and MSc education. A new report Tool catalogue frame-based information tools has been published. Differences in frames can lead to miscommunication and conflicts. This tool catalogue is intended as an idea-guide and eye-opener for organisations who are confronted with framing-related issues and who want to take these into account when developing knowledge, policy, or viewpoints. The catalogue does not aim to give a complete list of methods. Rather, it will present a number of characteristic examples of how various tools deal with framing. Some suggestions will be given on the situations for which these approaches are most suitable. For more extensive overviews of participatory methods, refer to the various stakeholder participation guidelines and catalogues that are available (several references have been included in the present document). Turnpenny et al. 2009, Noisy and definitely not normal: responding to wicked issues in the environment, energy and health Environmental Science and Policy 12 (3), pp. 347-358. Farrell, 2008, The Politics of Science and Sustainable Development: Marcuse’s New Science in the 21st Century Capitalism Nature Socialism, 19 (4), 68-83. Maxim and Van der Sluijs, 2007, Uncertainty: cause or effect of stakeholders' debates? Analysis of a case study: the risk for honey bees of the insecticide Gaucho® Science of the Total Environment, 376, 1-17. Refsgaard et al., 2007, Uncertainty in the Environmental Modelling Process: A Review Environmental Modelling & Software. 22 (11), 1543-1556. Risbey et al., 2005, Application of a Checklist for Quality Assistance in Environmental Modelling to an Energy Model. Environmental Modeling & Assessment 10 (1), 63-79. A new report Expert Elicitation: Methodological suggestions for its use in environmental health impact assessments has been published. It provides practical guidance on organising expert panels to assess uncertainty and risk. This document contains three parts: (1) an introduction, (2) an overview with building blocks and methodological suggestions for a formal expert elicitation procedure; and (3) a literature list with key sources of information used and suggestions for further reading. Uncertainty Communication: Issues and good practice. A practical guide to uncertainty communication has been developed for the Netherlands Environmental Assessment Agency. It offers background information on uncertainty communication, and contains suggestions and guidance on how to communicate uncertainties in environmental assessment reports to several target audiences in an adequate, clear, and systematic way. It is not claimed that this is the only way or the best way to communicate uncertainty information, but the guidance in this report draws upon insights from the literature, insights from an international expert workshop on uncertainty communication, and several uncertainty communication experiments in the Utrecht Policy Laboratory. Copernicus Institute Utrecht University and Tyndall Centre for climate change research issued a new report reviewing state-of-the-art of methods and tools available in the literature in helping inform adaptation decisions under uncertainty. The report reviews existing frameworks for decision making under uncertainty for adaptation to climate change. It explores how different ways of including uncertainty in decision making match with uncertainty information provided by various uncertainty assessment methods. It reviews a broad range of areas of climate change impacts and impacted sectors of society and economy that may require a response of planned adaptation. Post Normal Science essay by Eva Kunseler: Towards a new paradigm of science in scientific policy advising. The prevailing paradigm of science is not suitable for the science policy context with its different perceptions of reality and presence of great scientific uncertainty and ignorance. A paradigm shift is argued by the concept of post-normal science, which emerged from dissatisfaction with knowledge arising from the gap between policy questions and scientific answers. Scientific policy advising in normal and post-normal context exemplify the line of reasoning. · One day free course on Sensitivity Analysis at the JRC - Ispra.